Happy New Year! It looks like we’ve survived the holidays, and are back and ready to sim. Because of the holiday, administrative activity was pretty light this past month. However, I do have a couple of big announcements to make. I’ll start with the announcement that was posted a few days ago regarding Project Khitomer. Project Khitomer will be an online Star Trek roleplaying event hosted by Pegasus Fleet, Obsidian Fleet, and Bravo Fleet. The event will be held on Saturday, February 23, and will include a number of different panels to drive discussion on topics pertaining to simming and simming communities. Although Project Khitomer will be hosted by Pegasus, Obsidian, and Bravo Fleets, the event is open to the greater roleplaying community. We are accepting proposals for panel topics, and I have already received a number of great suggestions. We are accepting proposals through January 26, so please continue to send your ideas my way. Most likely the event will be hosted on Discord, but the exact details of the server and the event schedule will shared closer to the day of the event. I do encourage everyone to attend if you are available. I know that I am excited for this opportunity, and we have already been generating some excitement in the simming community. In addition to the excitement, there has been some confusion. 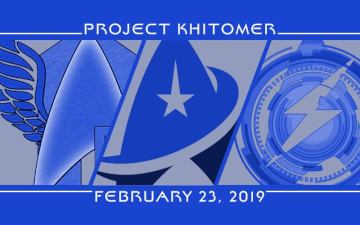 Project Khitomer is intended to bring the simming community together and to make all of our communities stronger by encouraging friendship and cooperation. What Project Khitomer is not is the groundwork for a fleet merger, or a requirement for joint missions or story arcs. Through Project Khitomer, our three fleets hope to share resources that lead to improvements to all of our fleets, not a way to combine them. I do see this as a great thing for Pegasus Fleet, and a way for us to show off our community in the larger simming world. The other major announcement this month is a loss, and an opportunity. As some of you may have already noticed, Commander Yorran has announced his resignation as the Task Force 56 Commanding Officer. He will be staying in Pegasus Fleet as the commanding officer of Starbase 831 (formerly the USS Galileo), but upcoming changes in his life are going to make it difficult to continue in his role with the Task Force. We wish him the best, and we look forward to seeing the future adventures of his sim. Of course, this does mean that there is an opening in the TF56CO position. We are now accepting applications from Fleet members who are dedicated to helping our COs and the Fleet to grow. Ideal candidates should have a good understanding of running a sim and managing potential challenges in a sim. They should be attentive and display strong communication skills. Interested members should apply by filling out the application form found at the link below. We will begin reviewing applications on Monday, January 21. If you want to be among the first applications that we review, please have your application submitted prior to that date. This month’s meeting will be held in the #meeting channel on Discord this Sunday, January 13. It will start at 3:00 pm EST. The meeting is open to all members of Pegasus Fleet and any guests. The next meeting will be held on Sunday, February 10. For the December Post of the Month, follow the link below, check out the nominated posts by clicking "[READ HERE]" next to each nominee, and vote for your favorite. Voting will close on Friday, February 8, so be sure to make your voice heard. Commanding Officers, be sure to remind your crews so that we don't miss anyone.